SBS ONE is expected to have replays later. Season two picks up six months on from the surprise bombshells of last season’s final. 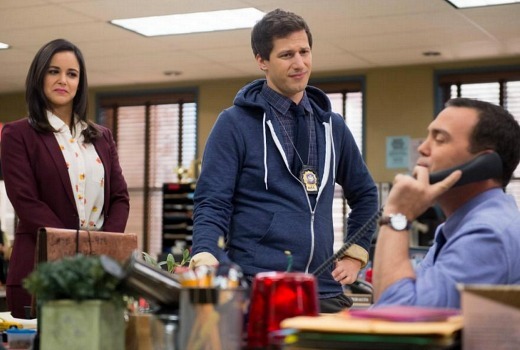 Detective Jake Peralta (Andy Samberg) announced he was leaving the precinct to go undercover in a top secret FBI investigation, and finally confessed his feelings for no-nonsense partner Amy Santiago (Melissa Fumero). ￼Season two special guests include Eva Longoria, ￼Kyra Sedgwick, Ed Helm and Nick Cannon. ￼Jake’s undercover FBI task ends in a success, until he learns one mobster has gotten away. So ￼Jake enlists Charles’ help to track him down. ￼Holt is taken by surprise when his longtime nemesis, Deputy Chief Madeline Wuntch (guest star ￼Kyra Sedgwick) arrives for an inspection of his precinct. Replays SBS ONE 10-11pm Friday following the A League. Well ep 1 & 2 are at any rate! 8pm is a better time for it than 9:30pm Monday. Didn’t mind the first season but not sure yet if I will watch the second. As its a short show it would be handy to be able to catch up on it on the official sbs windows phone app but sbs don’t make that show available on that app so there is less incentive to be a returning viewer.